With metigo MAP you can rectify your images true to scale. There is also a scaling function for the use of your scanned paper plans. Rectified images easily can be mounted and processed. Hence you can combine and overlay several images with different qualities (resolution, scale, rgb/b&w) in one mapping project. Using pre-existing digital image plans, CAD-plots or scaled paper drawings, you will measure 4-6 tie points in the image and in the drawing for an exact image rectification. An arbitrarily definable coordinate interface and the calculation of an UCS enable the use of discrete 3D-coordinates, measured on-site by totalstation. 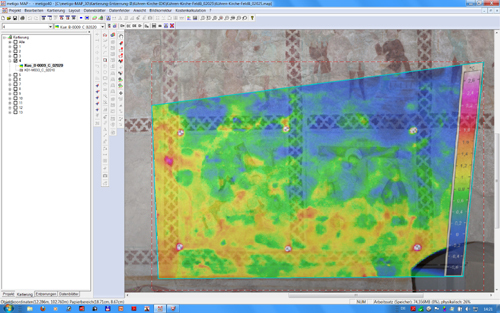 Based on an existing image plan, further more detailed shots can be automatically rectified on top by means of image analysis and without manually surveying any measurements and tie points. Based on an existing image rectification, thermographic pass points are referenced and will be automatically searched in a sequence of thermal image frames. By means of image analysis, an overall image of the object is used as reference to balance luminance and colour of subsequently uploaded detail shots. Using an calibration image in terms of a chess board (min. 9x12 cells) correction parameters (lens distortion and chromatic aberration) of the used lens will be calculated. In the course, images can be corrected with the parameters saved in advance of image rectification. 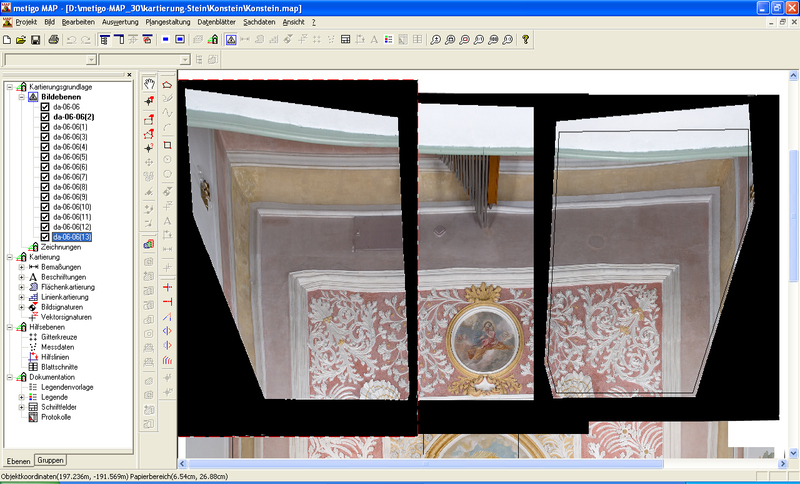 With version 4.0, the mapping software can import 3D surface models (sculptures, bas-reliefs and other objects). This is the basis for the to scale mapping on the object surface. 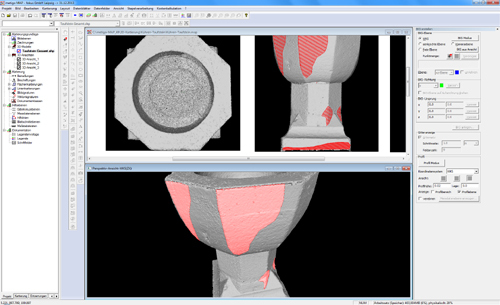 For the print-out, 2D-views of the 3D-object are created (UCS-management). These 2D-views can be created as orthogonal projection or as perspective representation.